tire monitoring and management solution. days. To visually see each fleet’s responsiveness to alerts, the average alert duration in hours and distance traveled is presented in gauges that indicate if response time is good or needs improvement. The map section of the dashboard provides color-coded vehicle markers that indicate the locations of all vehicles and those with alerts. Clicking on a vehicle marker pops up an info bubble revealing the vehicle’s unit number and type. A vehicle list provides each vehicle’s fleet and yard information in addition to its last known address. Finally a bar chart providing an up-to-the-moment tire pressure survey of all the fleet’s tires monitored by TireVigil Cloud is presented regardless of whether they are moving or parked which indicates the quality of tire inflation pressure maintenance being achieved by the fleet. "Never before have fleets been able to see the quality of their tire maintenance using their own real data in such a simple and clear way. And the wonderful thing is that TireVigil Cloud makes it easy for fleets to consume this extremely valuable information", said Peggy Fisher, TireStamp President. 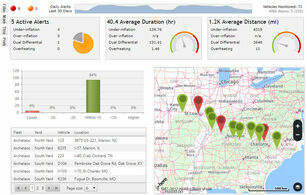 A video is available on TireStamp’s website that introduces the power of the TireVigil Cloud’s Maintenance Dashboard.